For the last couple of weeks, I’ve been treated to (and tortured by) a series of photos on Facebook of one of my friends, who is currently travelling around Italy. Whilst I may not be able to join in on the blue skies, clear waters, and beautiful historic sites, I can at least appease my craving with a good bowl of pasta. 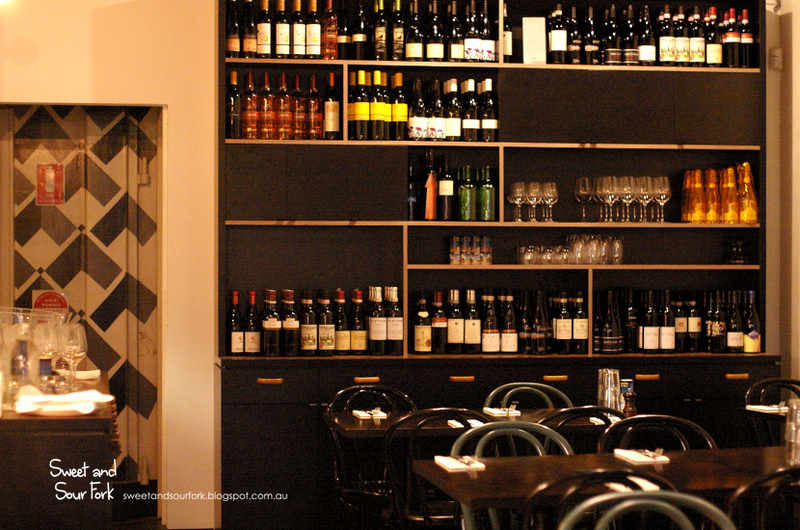 My usual go-to place for authentic but classy pasta (as opposed to an enormous feed by nonna) is Grossi Cellar Bar, but I’ve been hearing increasingly about the new it place for Italian in the CBD – Tipo 00. 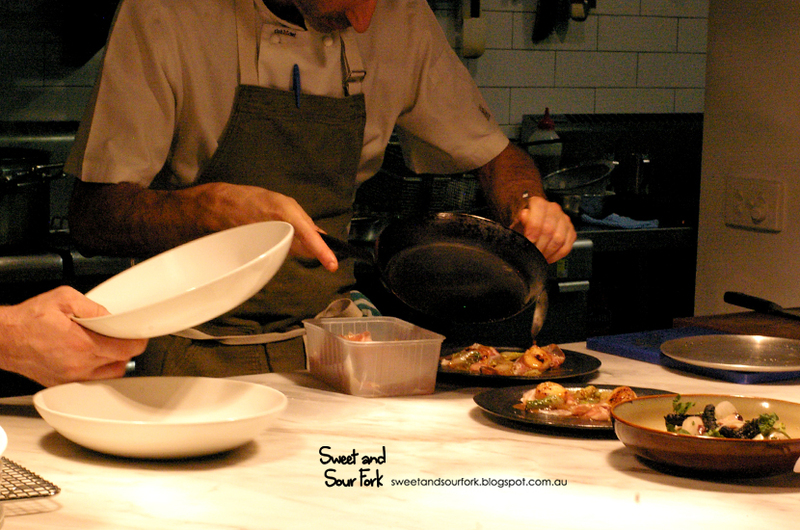 After having worked at Vue de Monde for 4 years, as well as stints at other Melbourne fine-dining destinations, chef Andreas Papadakis has turned his talented hands to creating this cosy but refined little pasta bar. 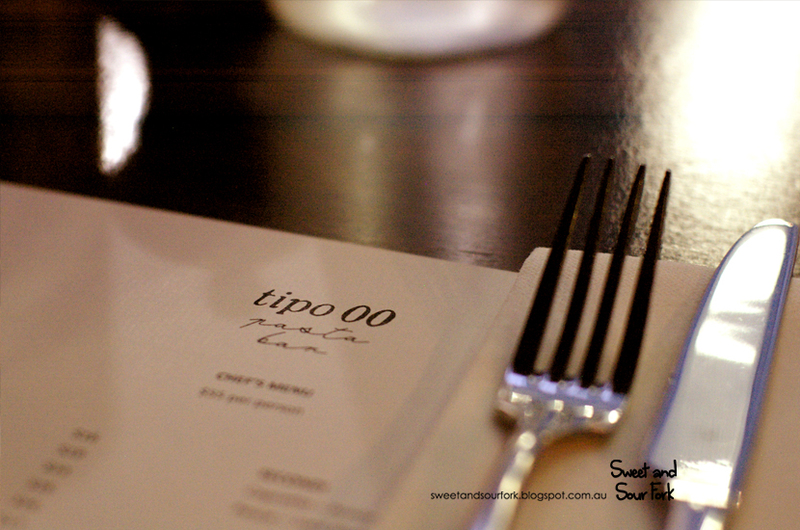 Since its opening late last year, Tipo 00 has quickly gained almost universal acclaim from both critics and diners. The 43-seater restaurant was predictably booked out for a Friday night, but we were confident of our chances of scoring some bar-seating if we showed up at about a quarter to six. For once, not even our habit of early dinners could save us, as the wait quoted was half an hour to 45 minutes (and get this: by 6:30, the wait-time was over an hour and a half). Luckily the restaurant gave us a call back within about 15 minutes, and though we were seated right by the door which let in draughts of cold air whenever anyone went in or out (and that’s extremely often), we were seated. The menu at Tipo 00 has been pared back, leaving nothing but a handful of entrees and pastas, and a few mains for the gluten-intolerant. Still, between the delectable specials and the debate of entree-vs-dessert, ordering was not as easy as you would expect. Once we had ordered however, we were rewarded with a plate of Foccacia with Ricotta. The bread was warm and crisp, seasoned with a moreish combination of sea salt and herbed oil. 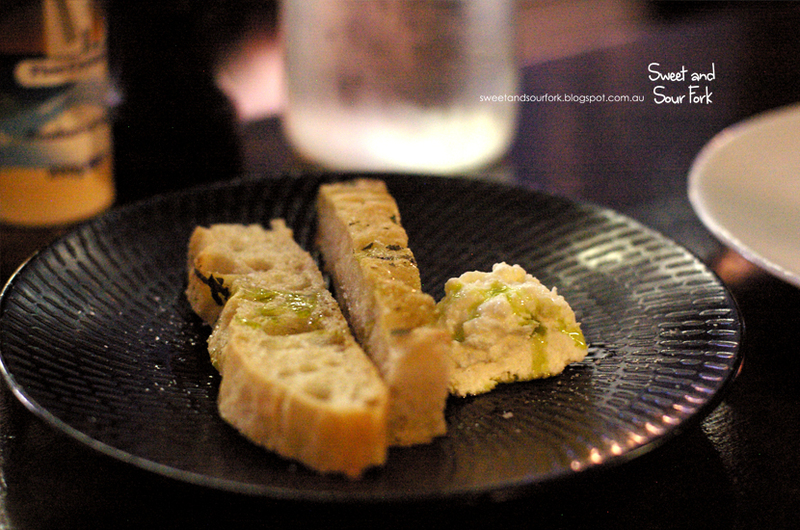 On the side was a cool dollop of ricotta, spreading smoothly and easily over the bread. It was also at this point that some bar seating freed up, and the angelic staff asked if we would like to be moved – an incredibly considerate suggestion that made our dinner much less cold, and much more enjoyable. 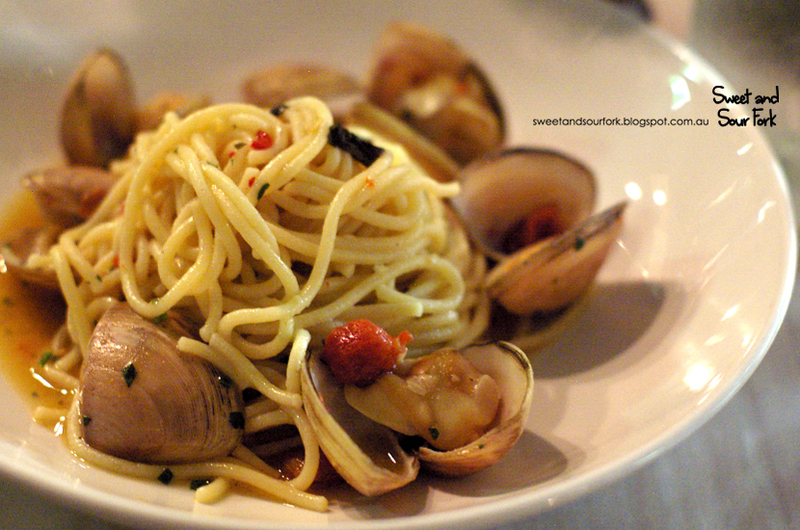 Though I’m happy to give anything a go, I will always order the spaghetti with clams if I see it on a menu. Tipo 00 served up a delicious plate of Spaghetti Affumicati ($24), consisting of spaghetti drenched in a gently briny broth with just a hint of ripe, smoky tomatoes and coarsely chopped parsley. Best of all were the thick, wheaty strands of pasta that satisfy the carb craving, whilst still being perfectly al dente. It was just as good, if not better than the spaghetti vongole at Grossi Cellar Bar. I never get food envy over Chris’ order, but there’s a first for everything, and the Gnocchi di Patate ($26) was deserving of my envy indeed. 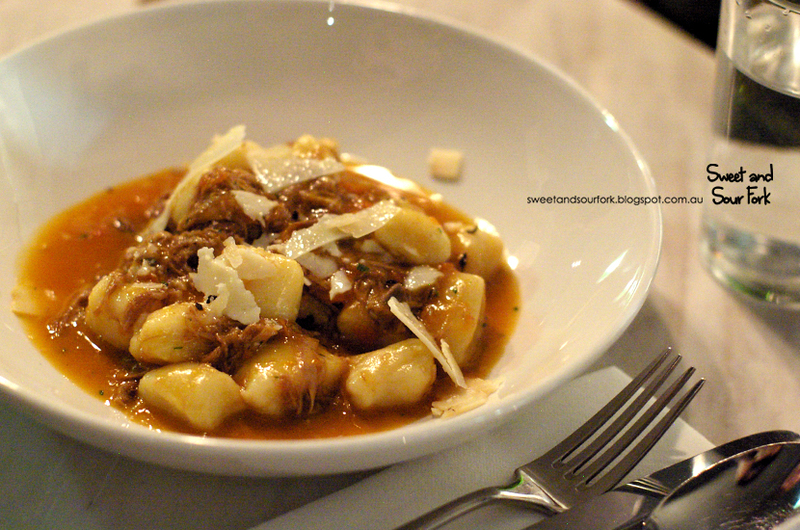 The gnocchi were draped with sticky braised duck and porcini mushrooms, the gravy rich and buttery, having extracted every last morsel of flavour in the process of slow-cooking. 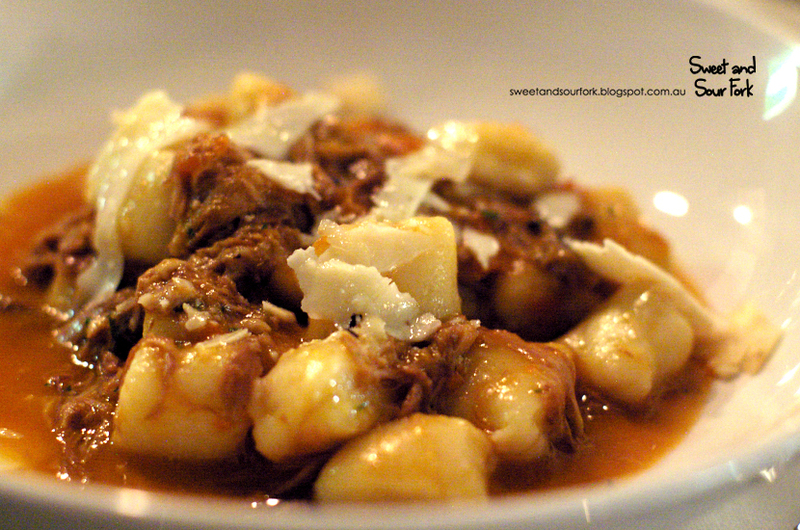 The gnocchi themselves were velvety pillows that melted in the mouth, its texture more like mashed potato than pasta, and were absolutely ideal for soaking up the sauce. Perfection was achieved with a generous grating of sharp pecorino cheese that brought the earthy, hearty flavours to life. Though the serve initially seemed small, it was indulgently rich, and there was almost as much duck as there was pasta. We ended up being entirely satisfied with the portion size. The waiter even offered us more bread to soak up the sauce, thus cementing their place in my heart. 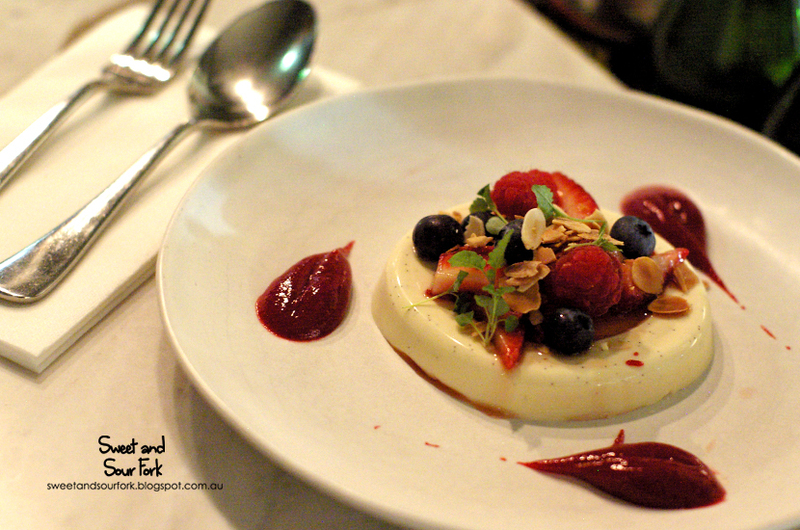 After finishing our pasta, we were satisfied, but with plenty of room left for the Pannacotta ($14). The flawless disc of cream and sugar was thick and silky, and flecked through with aromatic vanilla bean. That would’ve been excellent just on its own, but it was complemented by a bouquet of honeyed berries that tasted of the peak of summer, and streaks of intensely fruity raspberry compote. My only regret is not having room to try their tipomisu. 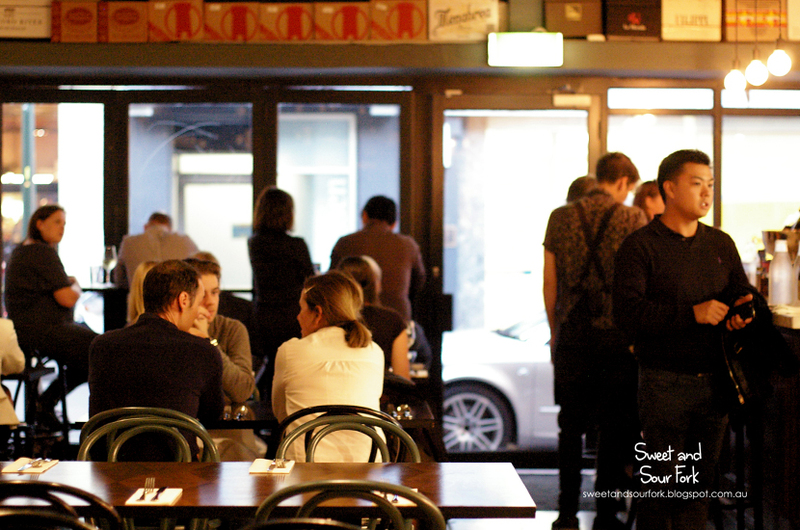 Even though I’ve had plenty of pasta in my time, I find myself continuously astounded by just how delicious simple and well-cooked Italian food can be, and in my opinion, Tipo 00 makes what is arguably the best pasta in Melbourne. I have to say that pricing is a little painful, but instead of regret, all I felt as I walked out was smugness, courtesy of all the good pasta lining my tummy. Rating: 16/20 – tipo of the pile.